A fun gift for the golfer who never skips the 19th hole. When sinking 40-foot putts, it's important to stay properly hydrated. 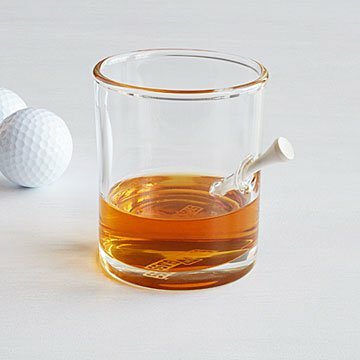 This glass has a golf tee cleverly wedged into its side, making it a fun gift for the golfer who never skips the 19th hole. Made of lightweight borosilicate in China. Pair your Tee Time Rocks Glass with our Golfing Coasters. Unique gift for a unique friend. This was the perfect gift for someone who has everything.